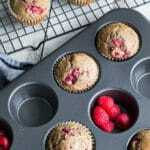 Raspberry Lemon Chia Buckwheat Muffins are wholesome and grain-free, made with almond flour, buckwheat flakes, coconut sugar, olive oil, eggs, lemon, chia and raspberries. They make a great snack for road trips or school lunches! Pre-heat oven to 425 degrees and grease a 12-cup muffin pan, or line it with cupcake liners. In a small bowl, sift together the almond flour, coconut sugar, baking soda, cardamom and salt. Set aside. In a medium-sized bowl, add the buckwheat flakes, almond milk, oil, chia seeds, egg, lemon juice and zest. Whisk together until well combined. Add the dry mixture to the wet mixture and stir until combined. Don’t over mix. Add in the raspberries, and stir enough to break up the raspberries into smaller pieces. Using a spoon or ice cream scoop, add the batter to the prepared muffin pan. Bake in the pre-heated oven for 16-18 minutes, or until a tooth pick inserted into the muffins comes out clean. Let cool in the pan for 5 minutes before transferring to a cooling rack to cool completely. Store in a container on the counter and enjoy within 2-3 days, or freeze for later enjoyment. Due to the higher moisture content in almond flour, these muffins will grow mold faster than muffins made with regular flour. So if you don’t plan on eating them within 2-3 days, store them in the fridge or freezer. If you don’t have almond flour or want to add grains to these muffins, you can use one cup of whole wheat flour instead of the 1-1/4 cup of almond flour. You will also need to reduce the baking soda to 1 tsp and the baking time to 15 minutes.